Begun working on the project with the band themselves, specifically guitarist Ryan Sellick. Got a feel for what they were looking for and a feel for the image they're portraying. They have a visual component to their concerts so I tried to include hints of the projection image and Thoth (Egyptian god of Knowledge and Writing who has the head of an ibis) mask they use in their shows. Got a large list of research and images from the band to kickstart ideas. 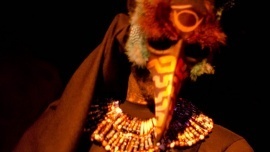 My 3 ideas all use the teal feathers from the Thoth mask, although one of them alludes to the projection video for the song "Tunnels" which includes an animation of a grasshopper and a bird. The birds I have portrayed all have the beak design from the thoth mask, however they are more raven-like than ibis-like and "We're not done yet, Karen" is a band-specific line. Karen is imaginary. I plan to run the sketches by Ryan to see what he has to say before deciding on a design. For now, I have to admit the grasshopper is my favorite.